It's funny how a little vinyl, and carpeting and plastic and metal can come to mean so much to a person. And its also funny how some people can take advantage of a person and others will bend over to help him or her. To most people, Lori Fuller was a young lady with a blue '69 Camaro SS Resto-Mod that needed interior work. But the car was special to Lori. It had belonged to her husband, who died in a California car crash along with their two daughters. Her husband loved the Camaro and she hoped to fix it in his memory. Lori took the car to one shop, where it sat for a frustratingly long time and nothing got done. Next, She took it to a second shop. The restorer said he could get an interior kit for the car and fix it. He priced out the job and Lori paid in advance for the parts, which were never ordered. Again the car sat and sat. Then, body shop owner John Diermeier heard about Lori's case. He contacted a friend who networked with people in the Resto-Mod industry. After a few calls, he found himself talking to Classic Industries, a Huntington Beach, California company that sells reproduction parts for Chevys, Pontiacs and Mopars. Rick Lara, the owner and president of the company, listen to the story and immediately offered to supply John the needed parts to get the car done. 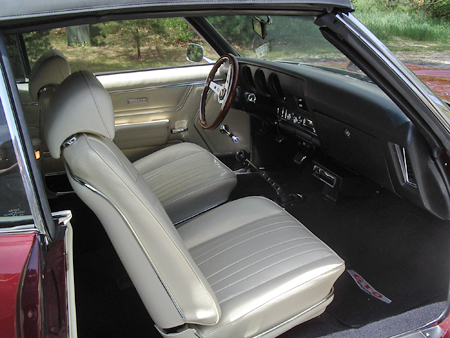 The well worn interior in Lori Fuller's '69 Camaro had extra holes bored into the door panels and kick panels for aftermarket radio speakers. 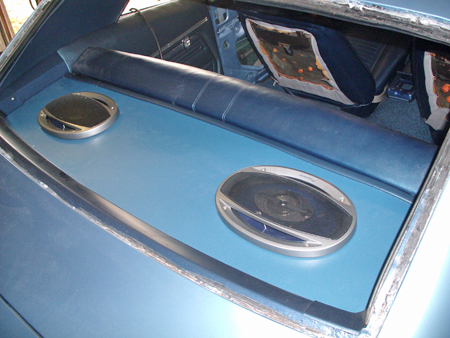 Over the years, circular holes had been cut into the Camaro's door panels to mount aftermarket radio speakers. The dash padding had cracked. The console lid was broken. 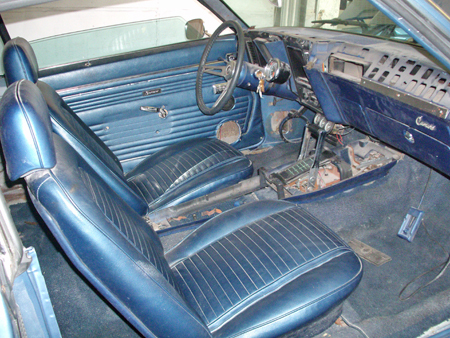 Other interior parts like the carpets and kick panels were faded or worn or torn. Worst of all, the interior had been largely disassembled by the second shop Lori had taken the car to. By the time the car arrived at Diermeier's shopâ€”John's Custom Autoâ€”and easy job had turned into a difficult one. "We had to find the parts and figure out where they went," says Diermeier. "None of them were labeled and many were taken apart, so the job took longer." Steve Kractt, Jr., spent a good chunk of time gutting the Camaro's interior. Here he is removing the driver's side front bucket seat. John and Steve Kractt, Jr., spent a good chunk of time gutting the Camaro's interior. They unbolted the front bucket seats and removed them. 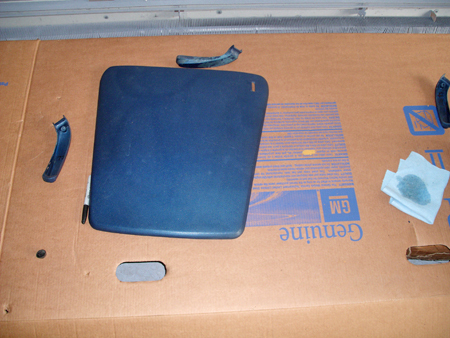 The clipped-in-place rear seat cushion was easy to pop out. The rear seat back came out, too. Then, the tattered old carpeting was lifted out as well. Other parts removed included the kick panels, door panels, inner rear quarter trim panels, the seat belt system parts and the rear package tray. The dash pad had already been taken out. Finally, the center console and related parts were removed. The back glass was removed from Lori's car. Unless you're experienced with clips that hold the chrome on and have tools to cut butyl tape, you may consider calling a glass company to take your front or rear glass out ($60 each) and put them back in, The cost is a bargain if it keeps you from breaking the glass. However, if you insist on doing it yourself, you'll need a window molding clip tool and a cold knife. A cold knife is a piece of aluminum rod with an "L" shaped blade. It has a cable with a handle that pulls the blade through the butyl tape. After you cut through the butyl tape, you can carefully lift the glass out. Other than the ugly speaker holes that had been cut into the kick panels and door panels, the major interior parts were not ruined. The seats did not have to be recovered. In fact, the only major seat work included removing and re-dying the plastic panels on the back side of the front seatbacks. The headliner and sun visors were able to be cleaned and reused. John made a list of all of the parts that did have to be replaced and sent it off to Classic Industries. The parts were all in stock at the company's expansive warehouse and were promptly shipped. Work on the interior of Lori's Camaro started with replacement of the carpeting. After the seats, console and old carpet were removed, John and Steve cleared away all of the old jute padding and sound insulation. They used a variety of tools, including a good stiff putty knife, to scrape the floor clean. With the carpet out of the way, they spotted some floor drain plugs that weren't sealed correctly. There was also a minor rust issue with a bit of surface rust showing. They applied a coat of rust inhibitor to the floor and sealed up the drain plugs. Classic Industries included instructions that pointed out that the better the floor pan was cleaned, the longer the new carpet would last. Following directions, John and Steve used a mild solvent to clean the floor pan. Steve used a yardstick to measure the jute padding so that the new padding could be trimmed. Steve uses a hot iron tool to burn holes for the seat brackets and seat belt hardware in the new carpet. Burning keeps the holes from fraying. 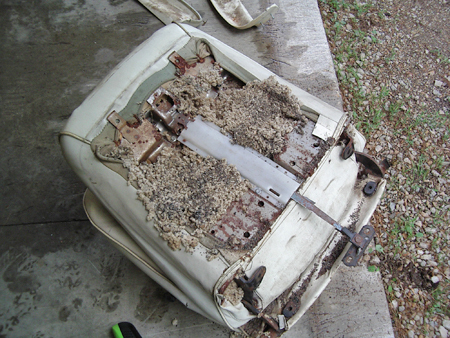 Rear seat cushion and rear seat back were held in by clips and removed for cleaning. Console on table at rear needed more work than seats. 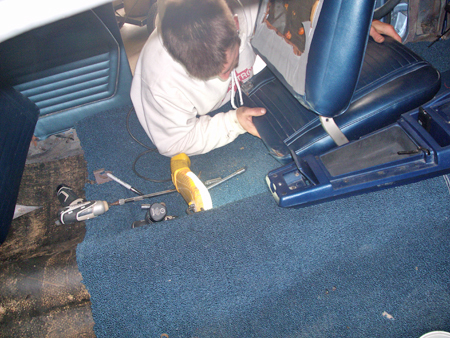 After cutting the padding and carpeting to size, Steve transferred the location of the original holes for the seat belts to the new carpet. He then heated up a hot iron tool and pushed it through so it made a hole without fraying the carpeting. According to John, that's a trick a lot of restorers don't know about. 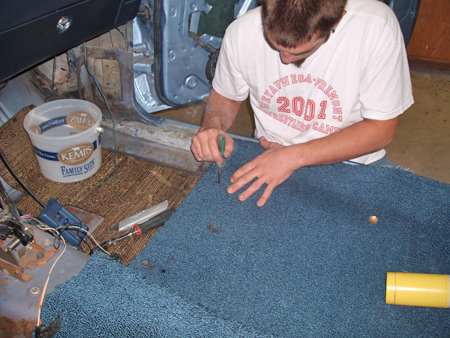 Do not cut any holes for mounting seats or attaching the seat belts until you have checked and re-checked carpet fit. Once the carpet is cut, it cannot be returned. Next, John and Steve laid the front section of carpet over the transmission tunnel and in the front floorboards, noting any areas where trimming would be required. Then, they did the same for the rear carpet section and the sound insulation that goes below it. Installation of the carpet came next. Nothing was rushed. Measure twice and cut once. Take your time and always be careful. Car had been disassembled by a shop that started working on it earlier. The dash pad had been removed. 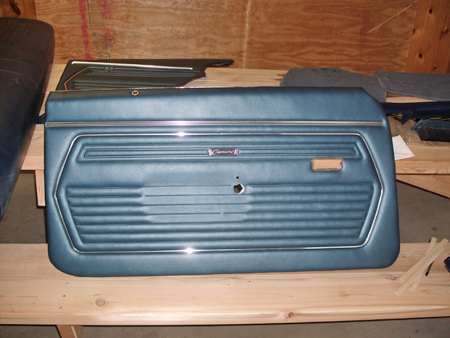 Interior restoration kit from Classic Industries included reproduction parts like these new medium blue door panels. 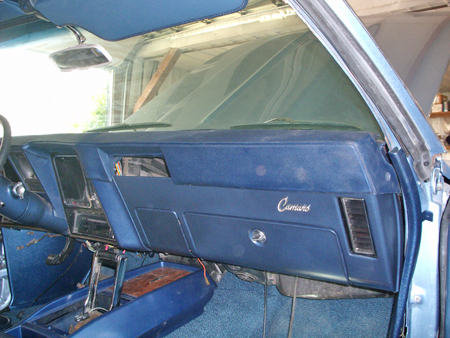 The plastic panel that covers the rear of the front seat back had to be re-dyed to look new again. Next, John and Steve turned their attention to refinishing the dashboard. They painted it with a PPG brand semi gloss product in medium blue. Semi gloss finish is used because it's not shiny and doesn't reflect any sun glare. The steering column was finished with the same paint. Then, the dash pad was replaced. All of the parts used for these tasks also came from Classic Industries.John Diermeier says that he and Steve had no problems with fit. The dash had to be pulled out to refinish the steering column and was refinished and replaced before the new pad was attached to it. 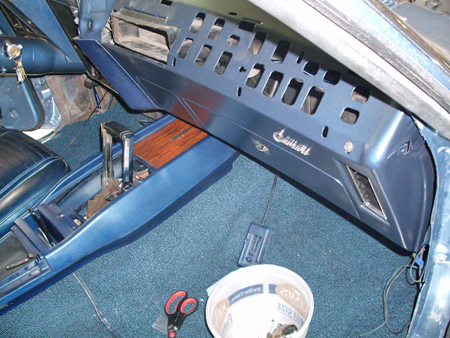 Here's how the re-dyed front seat back looked after it was re-installed on the seat. John had to refinish many plastic interior parts such as the seat belt bracket covers, console parts, the rear panels on the front seat backs and more. 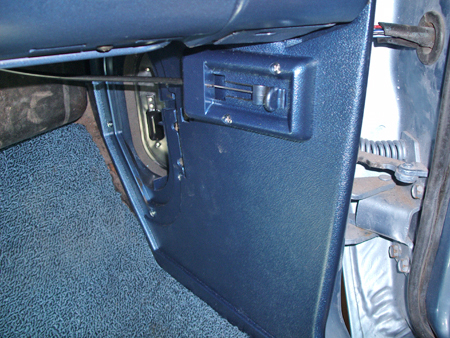 Parts like these were re-sprayed with medium blue vinyl dye. A product called PPG Multi Prep should be used to prep the plastic parts for the dye. It is very important to use this product any time you are spray painting plastic. In addition to nice looking new kick panels, this passenger side under dash area shows new carpeting. Although John and Steve did not have to install a new headliner, this is a relatively hard job for the home restorer and a good one to cover in some detail. As you remove the OEM headliner, pay attention to the parts and construction. Some bows that run from one side are different lengths. They should have paint dabs on them to tell you how they go in order and which side is which. Each rod goes into one of three holes at each end. As you disassemble the parts, mark the holes used. After the old headliner is out, half-tighten the screws for visors, hangers, dome lights, etc. Install the new headliner over the screws heads. Mark the new headliner at the screw heads to locate your holes. Pull the headliner taught as you go. Slide each bow into the cloth pockets. Four plastic clips or teeth hold the center bow in place and have to be bent over the rod one by one until it is held securely in place. Once the center rod is clipped in place, the new headliner will be hanging from the center rod. Then, you can put each of the other rods in its hole on the side rails until all of them are placed. If it is cold, you may have to use a heat gun to remove wrinkles and relax the headliner material, but do not stretch it too tight. Over time it will tend to shrink a bit, so leave room for that kind of thing. Put medium clamp-style paper clips around the perimeter of the new headliner to stretch it slightly. 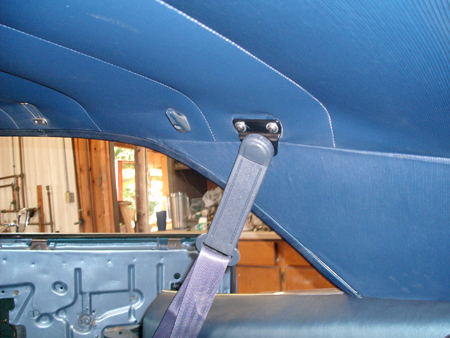 Seat belt and shoulder belt anchor covers were re-dyed to match the other new interior parts. On Lori's Camaro, the seat belts were basically in good shape, but needed to be dyed. The plan was to make everything look as new as possible. Everything that wasn't just like new was replaced. 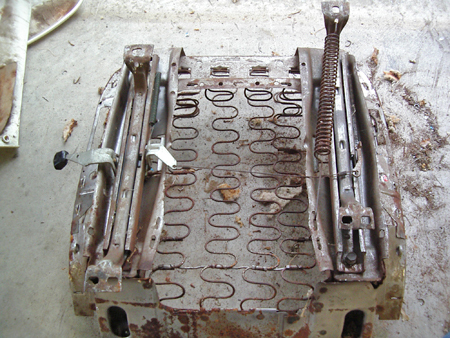 John Diermeier bought new seat belt bolt kits because the old ones had a little rust on them. 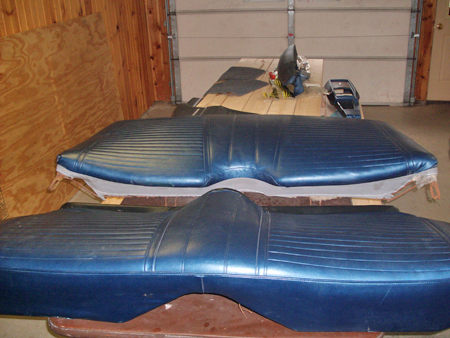 The seat bolts and shoulder belts all had blue vinyl plastic covers. John resprayed all of these pieces with the medium blue dye, after treating them with his PPG multi prep. Steve works on the seat belt covers. That jug next to him is PPG Multi Prep, which should be used when painting plastic parts. Sloppy speaker installs had ruined the Camaro's original kick panels and door panels. Lori wanted a stereo system and that would require speakers, so John and Steve opted to install them in the rear window package shelf. That way, if the car was ever sold to a collector, only the package shelf would need to be replaced. The speakers were nothing fancy. John Diermeier bought them at Wal Mart and carefully installed them behind the rear seat so they looked like they came with the car. Lori wanted speakers installed in the car, so to avoid cutting the new door panels, they were housed in the package tray. Rear window was removed. The new dash panel has been installed (but not cleaned up) in this picture. The metal under the pad was also refinished medium blue. While Lori Fuller's Camaro seats needed little more than disassembly, cleaning and redying of the vinyl seat backs, Jim Mokwa's GTO seats needed a complete rebuild from the springs and frames up. To rebuild seats, you need a couple of tools. 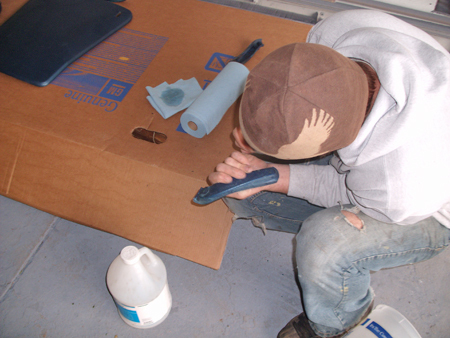 A heat gun is needed to properly stretch vinyl upholstery. You'll need hog-ring pliers is needed to squeeze closed the hog rings that hook seat covers to the seat frame. A set of plastic tuck and pry tools is handy to have for those jobs. You'll need other tools that you probably have like a razor cutter, scissors, pliers, screwdrivers and wrenches. The convertible Jim started with had sat outside and had also been abused. Time, weather and varmints had all taken their toll. To put it nicely, the seats were yucky. Jim ordered seat covers and door panel kits from PUI. 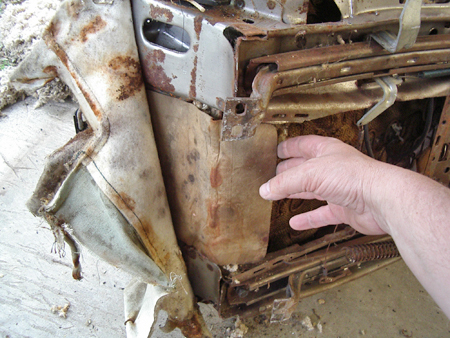 The old coverings were gingerly removed from the metal seat frame, which was fairly rusty in spots. The seats were torn completely down to the frames and springs. Jim ripped off the old vinyl and the stinky foam rubber. Nothing could be saved. Weather, years and little creatures took their tolls on Jim Mokwa's GTO seats. Jim saved as much of the original mounting hardware as possible. The frames and springs were refinished where possible and repaired or replaced if they couldn't be saved. A piece of burlap was then used to cover the springs and a new piece of foam rubber. The burlap was hog-ringed in place. New off white seat covers were placed over the foam. Use plastic bags to help the tight-fitting covers slide over the new foam. Attach the covers to the springs with hog rings. Peeling the vinyl off the GTO convertible seats revealed a bit of rust and corrosion. 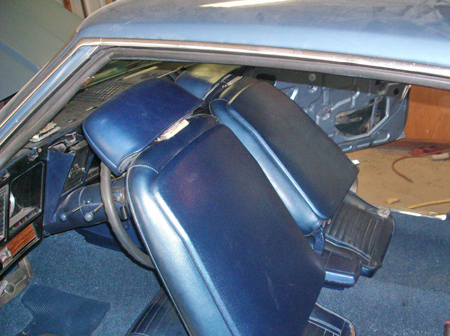 To restore the GTO's interior, Jim had to strip the seats all the way down to the frame and springs. Attach covers at the inside edges. Start near the middle and use wide spacing on the hog rings. Come back later to tighten the fit and add more hog rings between the first ones. This will allow you to pull out the sloppy fitting spots and wrinkles. Stretch the covers over the seats, using heat to make for a good fit. Do not overheat the vinyl or you'll ruin it. Pull, tug, even and smooth the vinyl. Be patient and you'll get a professional-looking seat cover install. The '69 GTO had fairly fancy seats with pleats and bright metal badges.